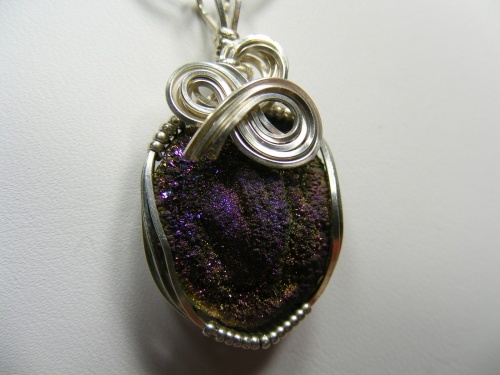 This unusually beautiful druzy has a raw back to it so you can show your friends its a real gemstone. Sparkling purple, gold and dk blue make this stone so beautiful. Piece is so unique youre going to be the only person that has this beauty it cant be duplicated as nature just doesnt do that. Piece measures 1 1/2" by 3/4" for those of you who prefer smaller pieces and comes with a sterling silver snake chain.